‘Thank you for standing by Israel at this time of historic change in the Middle East,’ Netanyahu tells Obama at Ben Gurion International Airport. You have chosen to come to Israel as the first foreign visit of your second term, you the leader of the United States, the world’s greatest democracy, have chosen to come to our somewhat smaller but no less vibrant democracy in the heart of the Middle East, the one and only Jewish state of Israel. On behalf of the government and the people of Israel, I come here today with a simple message for you and the American people: Thank you. Thank you for standing by Israel at this time of historic change in the Middle East. Thank you for unequivocally affirming Israel’s sovereign right to defend itself by itself against any threat. Thank you for enhancing Israel’s’ ability to exercise that right through generous military assistance, revolutionary missile defense programs, and unprecedented security and intelligence cooperation. Thank you, Mr. President, for upholding the Jewish people’s right to a Jewish state in our historic homeland, and for boldly defending that right at the United Nations. And thank you for strengthening the unbreakable alliance between our two nations during your Presidency. In an unstable and uncertain Middle East, the need for our alliance is greater than ever. It is the key to thwarting dangers and advancing peace; it’s the key to achieve a the stable and secure peace that the people of Israel yearn for with our neighbors with our all hearts. We seek a peace with our Palestinian neighbors. I look forward to working with you over the next four years to make the alliance between our two countries even stronger. Mr. President, on this historic visit, you will have an opportunity to see a different side of Israel. You will see past, present, and future in this tiny land which has left such a huge imprint on the course of civilization. You will see the ancient Dead Sea Scrolls, the world’s oldest text of the Bible, written in Hebrew here 2,000 years ago, scrolls that bear witness to the timeless bond between the Jewish people and the Land of Israel. You will meet the young men and women of Israel who make it one of the most creative and dynamic societies on earth. And you will see Israeli technology and innovation which is fundamentally transforming the way we live. Mr. President, Barack – on a lighter side, I had an opportunity to see your interview on Israeli television the other day. I took note of your desire to go incognito, so if you have a few free minutes, and you can arrange to slip away from your security – a daunting task – well, we picked out a few cafes and bars in Tel Aviv, as we even prepared a fake mustache for you. The people of Israel are honored to have you visit our country. We warmly welcome you as a cherished guest. We deeply appreciate your friendship. And we share your hope that the Middle East will enjoy a future of freedom, prosperity and peace. Mr. President, Baruch HaBa L’Yisrael: welcome to Israel. It is a great privilege for me and for the people of Israel to host you here in Jerusalem. It was a pleasure to sit with a true friend like you. After the meeting we just had, I am even more confident that your vision can transform the Middle East. Your vision is doable. You arrived here already with an impressive record of answering our needs, particularly and unforgettably in the domain of security. I want to thank you personally, my dear friend, for the long days and for the sleepless nights which you spend caring for our country, for our future. We live in an age that is both global and domestic. Interests may divide people but vision unites them. There is no real division between us. There is a common vision uniting us. To confront the dangers. To bring peace closer. The greatest danger is a nuclear Iran. So you said, so you are acting. We trust your policy which calls to first try non-military means with a clear statement that all other options remain on the table. You have made it clear that your intention is not to contain but to prevent. We are trying, together, to restart the negotiations with the Palestinians. We have already agreed that the goal is a two state solution. There is no better one and more doable one. We consider the President of the Palestinian Authority, Abu Mazen, as our partner in the effort to stop terror and make peace. Hamas remains a terror organization that targets innocent civilians. On our northern border Iran’s proxy, Hezbollah, continues to stockpile arms and threaten our civilians while they target innocent people across the world. Hezbollah is destroying Lebanon and supporting the brutal massacre of the Syrian people by President Assad. Fortunately the Syrian nuclear capability was destroyed but unfortunately the arsenal of chemical weapons remains. We cannot allow for those weapons to fall into terrorist hands. It could lead to an epic tragedy. There is an attempt to bring spring to the Arab world. This is an Arab choice, an Arab initiative. But it may bring as well peace to the region, freedom to the people and economic growth to the Arab states. If realized, it can lead to a better tomorrow. We pray it will become a reality. I believe the real division is between skeptics and those who believe in peace. Your voice will encourage belief. You came to us with a clear message that no one should let skepticism win the day, a vision that says clearly that peace is not only a wish but a possibility. I fully support your call. There is no other way to make the future better. There is no better leader to make it possible. Your visit is a historic step in that direction. We shall journey with you. President Peres, Prime Minister Netanyahu, and most of all, to the people of Israel, thank you for this incredibly warm welcome. This is my third visit to Israel so let me just say tov lihiyot shuv ba’aretz. I’m so honored to be here as you prepare to celebrate the 65th anniversary of a free and independent State of Israel. Yet I know that in stepping foot on this land, I walk with you on the historic homeland of the Jewish people. More than 3,000 years ago, the Jewish people lived here, tended the land here, prayed to God here. And after centuries of exile and persecution, unparalleled in the history of man, the founding of the Jewish State of Israel was a rebirth, a redemption unlike any in history. Today, the sons of Abraham and the daughters of Sarah are fulfilling the dream of the ages — to be “masters of their own fate” in “their own sovereign state.” And just as we have for these past 65 years, the United States is proud to stand with you as your strongest ally and your greatest friend. As I begin my second term as President, Israel is the first stop on my first foreign trip. This is no accident. Across this region the winds of change bring both promise and peril. So I see this visit as an opportunity to reaffirm the unbreakable bonds between our nations, to restate America’s unwavering commitment to Israel’s security, and to speak directly to the people of Israel and to your neighbors. I want to begin right now, by answering a question that is sometimes asked about our relationship — why? Why does the United States stand so strongly, so firmly with the State of Israel? And the answer is simple. We stand together because we share a common story — patriots determined “to be a free people in our land,” pioneers who forged a nation, heroes who sacrificed to preserve our freedom, and immigrants from every corner of the world who renew constantly our diverse societies. We stand together because we are democracies. For as noisy and messy as it may be, we know that democracy is the greatest form of government ever devised by man. We stand together because it makes us more prosperous. Our trade and investment create jobs for both our peoples. Our partnerships in science and medicine and health bring us closer to new cures, harness new energy and have helped transform us into high-tech hubs of our global economy. We stand together because we share a commitment to helping our fellow human beings around the world. When the earth shakes and the floods come, our doctors and rescuers reach out to help. When people are suffering, from Africa to Asia, we partner to fight disease and overcome hunger. And we stand together because peace must come to the Holy Land. For even as we are clear-eyed about the difficulty, we will never lose sight of the vision of an Israel at peace with its neighbors. So as I begin this visit, let me say as clearly as I can –the United States of America stands with the State of Israel because it is in our fundamental national security interest to stand with Israel. It makes us both stronger. It makes us both more prosperous. And it makes the world a better place. That’s why the United States was the very first nation to recognize the State of Israel 65 years ago. That’s why the Star of David and the Stars and Stripes fly together today. And that is why I’m confident in declaring that our alliance is eternal, it is forever – lanetzach. 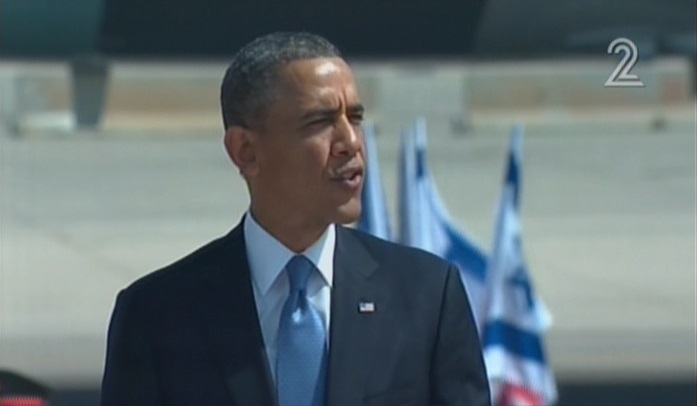 Live coverage of President Barack Obama’s visit to Israel. In an attempt to cast contention aside, the Israeli embassy in Washington and the U.S. embassy in Tel Aviv release amusing videos ahead of U.S. president’s trip to the Holy Land.